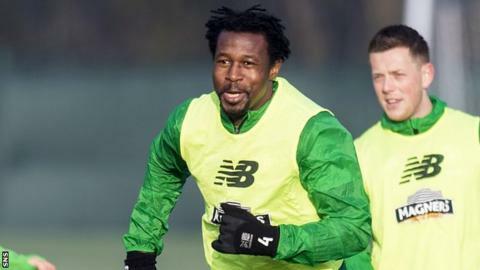 Efe Ambrose's proposed loan move from Celtic to Blackburn Rovers is awaiting an English FA ruling over a work permit for the Nigeria defender. The Scottish FA says the paperwork for the player who joined Celtic from Ashdod in 2012 was completed in time before the 23:00 GMT deadline. But their English counterparts have different rules regarding work permits. And the 28-year-old, who has played 51 times for his country, does not automatically meet the FA's criteria. Because Nigeria are ranked 50th in the world, he would require to have played at least 75% of their country's matches over the previous two years. Ambrose played twice last year and three times in the previous 12 months. The defender has fallen out of favour at Celtic this season since Brendan Rodgers took over as manager. He has only made two appearances, the last being a Champions League qualifier against Astana in July. Should he join Blackburn, he could partner former Celtic team-mate Charlie Mulgrew, who made the switch last summer, in the Championship side's central defence. However, he has also played at right-back and for Nigeria in central midfield. His move came on a day when Chelsea failed in a bid to sign Celtic goalkeeper Craig Gordon, while nothing came of reports of interest from the English Premier League leaders in his team-mate, striker Moussa Dembele. The only other movement out of Celtic on deadline day was goalkeeper Leo Fasan and defender Jamie McCart joining Port Vale and Inverness Caledonian Thistle respectively on loan and winger Michael Duffy leaving on a permanent transfer to Irish club Dundalk.